This tutorial describes how to write unit test for Android applications with the Robolectric framework. Robolectric is a framework that allows you to write unit tests and run them on a desktop JVM while still using Android API. Robolectric provides a JVM compliant version of the android.jar file. Robolectric handles inflation of views, resource loading, and lots of other stuff that’s implemented in native C code on Android devices. This enables you to run your Android tests in your continuous integration environment without any additional setup. Robolectric supports resource handling, e.g., inflation of views. You can also use the findViewById() to search in a view. Robolectric is not an integration test framework, i.e., you cannot not test the interaction of Android components with it. Robolectric does not require additional mocking frameworks, of course it is still possible to use frameworks like Mockito if desired. Robolectric replaced all Android classes by so-called shadow objects. If a method is implemented by Robolectric, it forwards these method calls to the shadow object. Shadow objects behave similar to the Android implementation. If a method is not implemented by the shadow object, it simply returns a default value, e.g., null or 0. To access a shadow object use Shadows.shadowOf. To use Robolectric for your Android unit tests, add the following dependency to your Gradle build file. Your tests should be stored in the src/test directory. The class containing your Robolectric test must be annotate with the @RunWith(RobolectricGradleTestRunner.class) test runner. It must also use the @Config() to point to your BuildConfig.class class. The following shows an example test configured to run via Robolectric on the JVM. Instead of specifying the values via the @Config annotation, you could also use a resources/robolectric.properties file. See http://robolectric.org/configuring for more information. 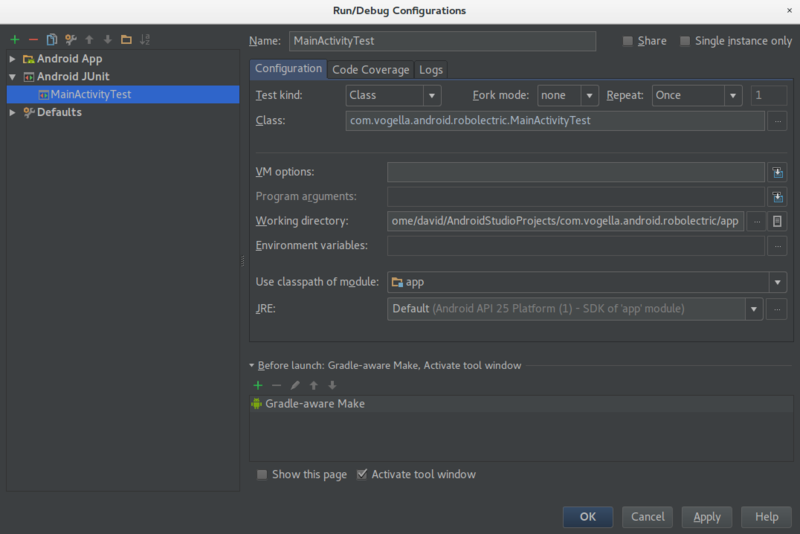 This exercise describes how to write a unit test for an Activity using Robolectric and Android Studio. Create an application called com.vogella.android.robolectric with an activity call RobolectricActivity. Use the com.vogella.android.robolectric top level package name. Adjust the layout file of your activity to the following. Create the following test class and place it in your src/test directory. This class tests, that the TextView has a top and bottom margin of 5dp and a left and right margin of 10dp. A method with a @Before annotation creates the RobolectricActivity. A method which is annotated with @Test is an actual test method and represents a single JUnit test case. At Use classpath of module select the app module of your Android application. As Working directory use the directory of your app module. Class is the file which contains your unit tests (in this case your ctivityTest class). Now you can simply select and run this run configuration to run your unit tests. Extend your activity and your test so that the following tests are successful.